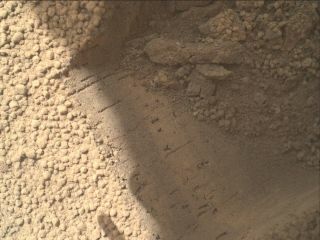 This image contributed to an interpretation by NASA's Mars rover Curiosity science team that some of the bright particles on the ground near the rover are native Martian material. Other light-toned material nearby has been assessed as small debris from the spacecraft. Curiosity's Mars Hand Lens Imager (MAHLI) camera took this image on the mission's 66th Martian day, or sol, (Oct. 12, 2012) showing part of the hole or bite left in the ground when Curiosity collected its first scoop of Martian soil five sols earlier. NASA's Mars rover Curiosity has found some more bright stuff on the Red Planet, scientists say. The Curiosity rover had dumped out a recent sample of Mars dirt after spotting shiny particles inside the hole dug by the shovel-like scoop on its robotic arm. Mission scientists were concerned that the bright material might be debris from the rover itself, so they ordered Curiosity to toss the Mars sample as a safety precaution, mission managers said in a statement. As it turns out, the bright particles are actual Martian in origin, they added. This image from the Mars Hand Lens Imager (MAHLI) camera on NASA's Mars rover Curiosity shows a small bright object on the ground beside the rover at the "Rocknest" site. The object is just below the center of this image. It is about half an inch (1.3 centimeters) long. The rover team has assessed this object as debris from the spacecraft, possibly from the events of landing on Mars. The image was taken during the mission's 65th Martian day, or sol (Oct. 11, 2012). Curiosity is scooping up Mars dirt in a spot called "Rocknest" in preparation to deliver the first samples to a pair of instruments on its car-size body. The rover scooped its first Mars sample on Oct. 7, but further work was delayed when the rover's cameras spotted a bright object —likely a piece of plastic —on the ground in the area. "Other small pieces of bright material in the Rocknest area have been assessed as debris from the spacecraft," NASA officials said in a statement Monday (Oct. 15). "The science team did not want to put spacecraft material into the rover's sample-processing mechanisms." A new review of the latest bright material suggested it is actually a Mars phenomenon, and not litter from Curiosity. With that analysis in hand, rover scientists cleared Curiosity to take a third scoopful of Mars dirt. "Confidence for going ahead with the third scooping was based on new assessment that other bright particles in the area are native Martian material," NASA officials said. "One factor in that consideration is seeing some bright particles embedded in clods of Martian soil." Curiosity's third scoop of Mars dirt will be the first sample to actually be processed by the rover's Chemistry and Mineralogy instrument, known as CheMin. A later Mars sample will be scooped up and deposited inside the rover's Sample Analysis at Mars, or SAM, instrument. The CheMin and SAM tools are two of the core instruments on Curiosity designed to determine if Mars may have once been habitable for microbial life. The $2.5 billion Mars rover Curiosity has been exploring the Red Planet since Aug. 5, when it landed inside the planet's vast Gale Crater. Currently, the rover is driving toward its first major science target, a spot called "Glenelg" that offers a glimpse at interesting Martian terrain, scientists said. The rover is about the size of a Mini Cooper car, making it the largest rover ever sent to another world. Curiosity is expected to spend at least two Earth years exploring the Red Planet. NASA will provide an update on Curiosity's science work on Mars today (Oct. 18) in a teleconference at 3 p.m. EDT (1900 GMT). You can listen in on the teleconference via SPACE.com's NASA feed here.